I’m joining the 2019 Finish-A-Long, but I’m barely dipping my toe in the waters, so to speak. I hate setting goals I have no reasonable hope of achieving, so for the first quarter I’m going to nominate one small project that I’m certain I can get done. As I’m in Australia, I’m linking through Sandra of Sew Of Course in Ireland. This top is one of my oldest UFOs. It was made in a workshop with Sara Nephew in 1994, when she attended the Australasian Quilt Convention in Canberra. I loved her workshops but, as you can see, my fabric choices weren’t great. The pink, mint green and floral green fabrics were bought for a sampler class in 1988 (the results of that were so horrendous they’ve never seen the light of day in thirty years). I think most of the others came from curated long quarters packs. The top is roughly a metre square so it shouldn’t take long to baste, quilt and bind. Even though I don’t like it, I’m sure the cats won’t be as fussy. It may be odd to have a “year in review” as my first real entry but it probably counts as mayhem, so I won’t apologise. 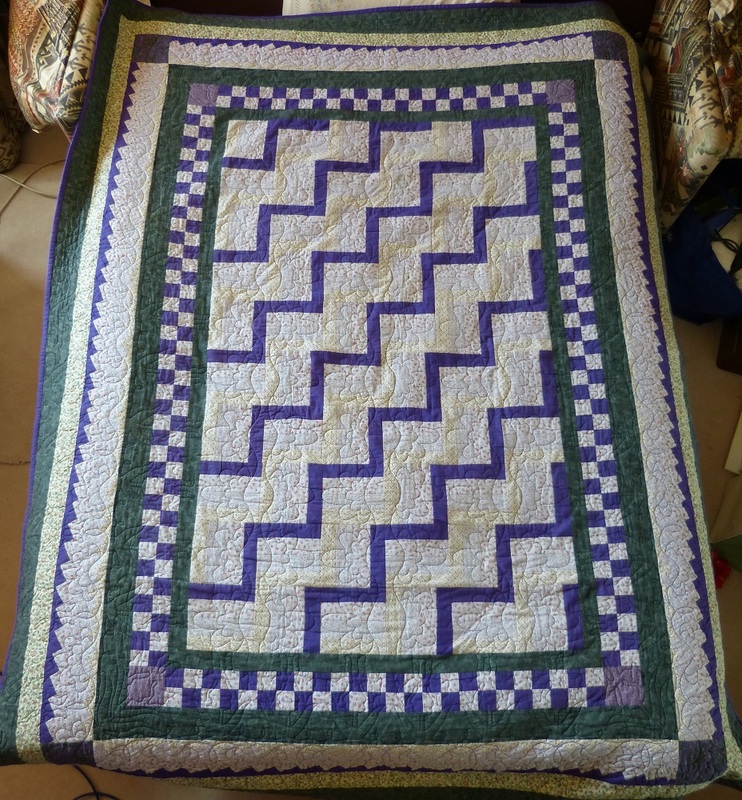 As I state in my “About Dendaria” page, most of my quilting is for Aussie Hero Quilts. I made five quilts and twenty-two laundry bags in 2018, which is about average for me, but since all the quilts and laundry bags are shown on that blog I won’t duplicate them here. I am currently working on a quilt for a recipient, plus I’m doing a scrap Idaho Square Dance which may get a specific recipient or may go to the Wounded Warrior stash. I finished one quilt top in May, called Pentastic — it’s a Penrose P3 aperiodic tiling design and was done as an EPP project, commencing in December 2015. I love the top but the EPP was very tough on my wrists. It’s absolutely enormous (about 112″ x 106″) and basting wasn’t completed until the end of August, at which time the weather promptly warmed up and it became too hot to sit under a quilt for hours on end. I’ll start the quilting next April when it’s cooler, and with a little luck I’ll have it done by September 2020. NB that is not me in the photo, I’m off to the side and out of the frame. Within a week of finishing the Pentastic top I started another Penrose P3 design. This one is entitled Flame Rose and is being done as “ordinary” hand piecing. I’m using acrylic templates from the large set for “La Passacaglia” with 2″ sides. It’s coming together very well and will get its own post soon. I did 18 of 20 Hawaiian appliqué blocks (from the book by Elizabeth Root). I have two more blocks to do and then the quilt will need a border — my intent is to do a meandering vine with small versions of the appliqué motifs. I worked on some Esther Aliu applique designs – Lily Rose and Diamond Hill. I don’t want to do the given setting for DH (far too much fiddly work, though I admit it looks fantastic) so I’ll combine it with the Lily Rose block in the centre and then work on a suitable appliqué border. Since it will be a wall hanging rather than a quilt I may do some beadwork embellishment. I don’t have any photos of these blocks yet as I’m still working on the embroidery. My last current project is an autumnal-theme quilt – it’s my own arrangement and quite complex so that will also get its own post in due course. Like everyone else, I have multiple UFOs, some dating back to the late 1980s, including several tops that need quilting, tops that still need borders, and some block sets that need to be assembled.